Whether you’ll apply them in tactical situations or on night hunts, night vision goggles are an item you don’t want to skimp on. There’s a big difference between “any old” pair that will ultimately prove minimally functional and a quality pair that make you feel like you’re operating with the best visibility possible in your situation. The Top Night Vision Goggles of 2019 vary in price and functionality. Finding the right pair for you will depend on a number of factors, including your personal preferences. In this article, we’ll highlight ten of the best night vision goggles on the market today. We’ll also provide a comprehensive Buyer’s Guide that gives you a clear framework for choosing night vision goggles that fit your needs and your budget. This night vision monocular is an affordable option for novice hunters looking to experiment with night hunts. Although priced below many of its competitors, it offers functional quality and the right additional features to make it useful in a variety of scenarios, including wildlife observation and cave exploration. The Solomark Night Vision Monocular comes with multi-coated glass objectives, a high sensitivity sensor, an integrated color LCD-screen, and a three level IR LED illuminator. These features give you the ability to view in the dark, with the brightness you want, at distances up to 328 feet (100 meters). In addition, this night vision monocular boasts the ability to capture photos and videos for post-excursion viewing. The ATN NVM14-3 Gen 3 night vision monocular can be hand-held, head-mounted, helmet-mounted, or weapon-mounted. It’s an ideal multi-purpose night vision system for walking, driving, weapon firing, short-range surveillance, map reading, vehicle maintenance, and administering first aid in either moonlight or starlight. This monocular is equipped with an infrared light emitting source and its optical system provides imagery using an objective lens, image intensifier tube, and an eyepiece. It offers 25-millimeters of eye relief and can be adjusted in multiple directions (vertically and fore-aft) for a customized, comfortable fit. Finally, this monocular features an infrared illumination range of 20 meters and a power life up to 40 hours. 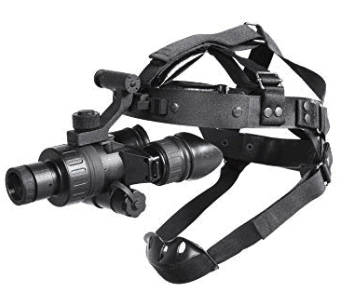 These night vision goggles are field tested and approved by the North American Hunting Club. It uses a dual-tube system for comfortable viewing, which is easier on the eyes than a single-tube system. It also can be head-mounted for hands-free operation or hand-held for quick deployment when searching for targets. The Sightmark SM15070 Ghost Hunter comes with a high-powered infrared illuminator and 1x magnification. These components work together to provide a crystal clear image for locating targets at short range in low-ambient light conditions and/or total darkness. These goggles also feature an automatic shut-off feature, which turns the unit off when it senses exposure to bright light and saves you precious battery life. The NOBG1 tactical goggles from Night Owl Optics are a military-style system best used for hands-free operation with a head-mask or helmet. It has a hinged quick-release mount that gives you the ease and convenience of flipping the goggle up out of your field of view or detaching to use as a hand-held binocular when needed. These tactical night vision goggles provide a non-magnified, 1-to-1 image with a wide field of view. This makes them a great selection for walking or operating a vehicle. They also come with F1.4 lenses that improve depth perception and a light sensor that automatically cuts power to prevent burn out of the intensifier tubes when the goggles are exposed to a potentially damaging light source. Ideal for hands-free use, this night vision system is engineered around high-grade, Gen2+ image intensifier tubes. It’s also a great option for use in total darkness, as it comes with an infrared light source that illuminates surroundings and helps to provide bright, clear night vision images. These goggles are built with the highest grade optics and simple, reliable electronics. The Armasight Nyx-7 OSi Gen 2+ night vision goggles are an exceptional choice, especially at their price point. They are waterproof, rugged, light, and compact. They can be used with a universal helmet mount or head mount to provide flexibility on tactical missions or night hunts. These night vision goggles also come with a battery adapter, lens cap, lens tissue, operations manual, and soft carrying case. The ATN PVS-7 Gen 3W night vision goggles are standard issue for U.S. Army ground troops and designed to provide exceptionally reliable service in the most unfavorable conditions. It’s a high-performance, durable night vision system that can be trusted across a variety of tactical situations and it is designed with a full U.S. Mil-Spec body. These night vision goggles come with a fully adjustable strap so that you can comfortably mount them to your head or helmet. They are waterproof and feature an infrared illumination source so that they remain fully functional in total darkness. These goggles also boast a 50-hour battery life and a quick F1.2, 26-millimeter lens system. The goggles come with a lens cap and cleaning tissue, packing box, soft carrying case, demist shield, sacrificial filter, two AA batteries, and a head mount assembly. These lightweight night vision goggles are designed with an ergonomic, rubberized body, which gives them a sleek and modern appearance while maintaining durability. They are designed to help you maintain optimal functionality in low ambient light conditions or total darkness. Their design also allows you to flip the optics up when not in use so that you can easily flip from night vision to your own eyesight. The Yukon – NV goggles offer about 40 hours of battery life and offer 1x magnification with a 24-millimeter lens diameter. Multicoated optics work to provide clear images and a pulse infrared illuminator helps to provide enough light for these goggles to maintain functionality in total darkness. Finally, these night vision goggles are designed without a lot of frills. They’re light, solid, stable, and comfortable. The PVS-7 Gen 3 night vision goggles from Superior Tactical are made to be versatile and durable. They can be hand-held of head/helmet mounted and boast mil-spec compliant housing. They are also lightweight and weather-resistant to maintain usability in less-than-favorable conditions. These goggles are robust, dependable, and, most importantly, they perform when you need them most. These night vision goggles boast 1x magnification and a 40-degree field of view. They offer about 50 hours of battery life and feature Superior Tactical’s third-generation of intensifier tubes, which provide the best clarity. The goggles have internal indicators that tell you when the battery is running low and when your infrared illumination source is switched on. In terms of image resolution, it’s hard to beat the Pulsar Edge night vision goggles. Their unique combination of R-contact optics and Gen Super image intensifier tubes work together to provide the highest edge-to-edge resolution performance ever seen in a budget consumer night vision setup. These goggles are an excellent choice for hunters interested in pursuing any game that’s most active at night. These night vision goggles are lightweight and boast a compact R-contact optical system. They come with a 5-lens eyepiece that increases image sharpness and contrast while minimizing distortion throughout the entire field of view. They also boast a soft rubber eyecup that traps light emission for improved concealment. Finally, these goggles come with the Pulsar Compact Head Mount to provide hands-free night vision viewing. For those that prefer a monocular, Bushnell’s Equinox Z offers 6x magnification and 50-millimeter objective lens diameter. It’s an incredible night vision tool for those in need of long-range image capability in low ambient light conditions. This monocular also features an adjustable infrared brightness for use in total darkness. This night vision monocular is also one of the few night vision systems that offer daytime color, which makes image clarity appear as if you’re operating in full daylight. This system offers a built-in illuminator that helps it achieve viewing distances up to 1000 feet (305 meters). It’s also capable of capturing images and video for post-tactical viewing. In night vision goggles, the eyepiece magnifies the image so that the user can move about and locate targets without any active illumination sources (1). This is critical for soldiers and hunters operating at night when stealth is of the utmost importance. While night vision goggles are most commonly used in the military, their functionality extends beyond the duties of those in the armed forces. Some of the first night vision devices were actually deployed by the German army as early as 1939 (2). In this Buyer’s Guide, we’ll discuss several factors that you should pay attention to when selecting a pair of night vision goggles, including monocular versus binocular, choosing between generations, and essential accessories. Most of us think of binoculars when we hear the term “goggles” or when we think about night vision in general. That is, unless you think of the quad goggles featured in Zero Dark Thirty (3). However, most folks just entering into the night vision market will want to go with a monocular as they get comfortable with night vision. Besides the fact that monoculars are generally more affordable, their also much more versatile. Monoculars can be used in your hand, on your helmet, or on your firearm. They also allow you to keep one eye free to preserve your natural night vision, which can sometimes be more effective than night vision. Interestingly, you’ll generally maintain about a 40-degree field of view with either a monocular or binocular, so there’s really no difference there. The main con of a monocular is that it can take new users some time to get used to keeping both eyes open. This is the preferred method of using a monocular for the best experience and widest field of view. Night vision goggles (or binoculars) provide the most benefit navigating over shorter durations or for stationary observation activities. They tend to give the user better depth perception than a monocular but do tend to weigh more. They also have the disadvantage of being less versatile, as they really excel in specific navigation and observation applications. As companies seek to improve their night vision goggles, they release new generations with additional features and (hopefully) improved optics. There are generally four generations of night vision goggles you’ll have to sort through. The first generation dates all the way back to the Vietnam era (4). Most of the night vision systems from these days are massive and outdated today. While you’ll still find a handful on the market, most have become collector’s items and have very little practical usage nowadays. The second generation of night vision dates back to the 1980s. They utilize what was, at the time, a vastly improved detection plate. These models improved resolution by an astounding 150 percent over their first generation counterparts. Night vision systems with this technology are entirely usable and the more affordable options you see on the market today utilize Generation 2 technology. The third generation of night vision uses technology developed in the 1990s. The major change was using a different type of gas in the image intensifier tubes. This change achieved another 30 percent improvement in image resolution over Generation 2. Many of the best night vision goggles on the market today utilize this type of technology. The fourth generation of night vision is still in relative infancy. Gen 4 technology only offers a relatively modest 10 percent improvement over Generation 3. The major improvement is in reducing the halo that appears around bright objects in most night vision goggles. The downside is that this technology makes Gen 4 night vision systems quite expensive. Image clarity in night vision goggles is typically measured in line pairs per millimeter. Most folks talk about night vision clarity in terms of how well the goggles allow the user to distinguish between objects that are close together. In general, a higher resolution means better clarity, but it’s good to note that, in some models, the resolution at the center of the image will differ from the resolution at the image’s edges. This is especially true for Generation 1 night vision systems. Recognition range refers to the distance at which you’ll be able to make out (and ultimately target) objects when using night vision goggles. Most of the best Generation 3 night vision goggles achieve recognition range right around 300 yards. This is considerably less than the best riflescopes on the market, which have ranges upwards of 1,000 yards. With night vision goggles, the range is also dependent on the amount of ambient light available. In total darkness, your range will be much less than when operating during a full moon, for example. Many night vision systems come with a variety of accessories meant to enhance their performance. However, if you purchase a monocular or set of binoculars “a la carté,” you’ll likely need to grab a few other items to make your night vision setup fully functional. These essential accessories include, but aren’t limited to, helmets, illuminators, IR lasers, and counterbalance. Many functional systems include a head mount strap. But this strap is often designed to fit snugly over a helmet, as opposed to your naked head. There are two basic types of helmets to choose from if you’re going to be using your night vision system in tactical scenarios. They are ballistic helmets (5) and bump helmets (6). The exact helmet that’ll be best for you will depend on how you’ll use it and your personal preference, but it’s important to know that a helmet is an essential accessory if you plan to use your night vision system in a hands-free manner. Fortunately, many of the best night vision goggles feature built-in illuminators. However, that’s not always the case. If you purchase a system without an illuminator, you’ll need to buy one unless you don’t plan on using your goggles in total darkness. Most quality night vision goggles will retain functionality in low ambient light conditions, even without an illuminator. However, when you try to use them in total darkness, you’ll need an infrared illuminator for clear, useful imaging. Many built-in illuminators are only useful over a relatively short distance. While this can work for walking and short-range observation when stationary, you’ll need more illumination when driving or viewing targets at a distance. There are a variety of standalone illuminators (7) that you can use to improve the performance of your night vision goggles. You’ll just have to make sure the one you buy is compatible with your goggles. This is really important for those seeking night vision goggles for hands-free use. As you can imagine after viewing some of the setups above, these goggles can place a lot of weight in front of your helmet. Without a proper counterbalance, your neck is going to be screaming at you in just a few hours (or less!). Placing weights on the back of your helmet will effectively counterbalance the weight of your night vision goggles so that you’re not using neck strength alone just to keep your head up. Depending on the battery life of your goggles, you might even think of using an extra battery (or two) as a counterbalance. If you’re unfamiliar with night vision goggles, there can be a lot of technical terms to wrap your head around. In this section, we’ll answer some of the more common questions about night vision so that you have a better understanding as you continue your search. To put it as simply as possible, night vision goggles gather what little light is available (usually starlight, moonlight, or infrared light) into the objective lens. This light enters a photocathode tube that’s filled with gallium arsenide. Inside the tube, the light energy (‘photons’) is converted into electrical energy (‘electrons’). These electrons then pass through a microchannel detection plate that essentially ‘amplifies’ that electrical energy. This increased energy (more electrons) then passes through a phosphor screen that converts the electrons back into photons, or ‘visible light’. This visible light is what you see when you look through the eyepiece and the amplification typically produces a bright greenish hue that we usually associate with night vision. Most night vision goggles produce the green imagery that many of us are familiar with. This is because of the color of phosphor on the tube. White phosphor is Gen 3 technology and gives the viewer more defined shadows. As you might imagine, however, goggles with this tech tend to cost more. What is an IR illuminator? ‘IR’ stands for infrared. An IR illuminator is a device designed to project infrared light in front of your night vision goggles. Infrared light is virtually invisible to the naked eye but highly visible when using night vision equipment. Most provide illumination over a relatively short distance, but even the most technologically advanced night vision goggles perform better with a built-in IR illuminator. Any time you’re dealing with total darkness, an infrared light source is essential. How does the objective lens diameter affect the image? The diameter of an objective lens impacts the amount of light that’s allowed in and (eventually) transmitted to your eye. While there’s a tendency to think bigger is always better, the other design elements of a specific pair of night vision goggles also play a role in image quality. When it comes to choosing night vision goggles, it’s important to know that a larger lens diameter means more opportunity for your goggles to capture ambient light. But factors such as glass quality, magnification, and IR illumination will also dictate image quality. Why let a lack of light stop you from hunting that elusive nocturnal game your friends have been talking about? With night vision, you can safely operate at night and minimize time spent fumbling about in the dark so that you come home with the prize you’re looking for. We hope you’ve enjoyed this review of the best night vision goggles and buyer’s guide. We wish you the best of luck in your search and upcoming adventures!